The 'h' means the highest altitute for the month for the Southern Hemisphere. Meteor information from the International Meteor Organisation. Visit Meteors Online's Meteor Calendar for more information on meteor showers for other months of the year. Comets are small, irregularly shaped objects composed of a mixture of rocks, dust, and what astronomers refer to as "ice" - frozen water, methane, and ammonia. Most have highly elliptical orbits that bring them close to the Sun and then swing them deep into space, often beyond the orbit of Pluto. When a comet is far from the Sun, it is frozen solid into a tiny nucleus. But comets put on a spectacular show when they visit the inner solar system. As a comet gets closer to the Sun, the surface of its nucleus warms. Icy materials begin to sublime into gas. 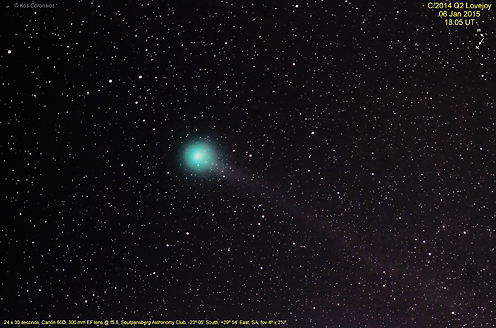 As the gas boils off the comet, it can take small particles of dust with it. The gas and dust forms a cloud of diffuse material, called a coma, that surrounds the nucleus. The coma can swell to many times the size of the nucleus. If the comet gets close enough to the Sun, the solar wind can blow gas and dust away from the comet, forming elongated and often multiple tails of gas and dust. The tail always points away from the Sun - not away from the comet's direction of motion. Meteor showers occur when the Earth collides with a collection of particles also orbiting the Sun. It is usually believed that these particles of ice and dust are the remnants of comets that once passed through the inner solar system. When these meteoroids enter the Earth's atmosphere, friction with the air causes them to heat up and glow. Most meteoroids burn up completely in the atmosphere but occasionally one survives to actually hit the Earth. This object is then termed a meteorite. Not all meteorites are pieces of comets. A number of meteorites have been found in the Antarctic which have been traced back to our neighbouring planet Mars! Larger meteorites may be pieces of asteroids. Meteors can be seen on any clear night although they are usually more prevalent after midnight. If you are lucky, you might glimpse a sporadic bolide or fireball.